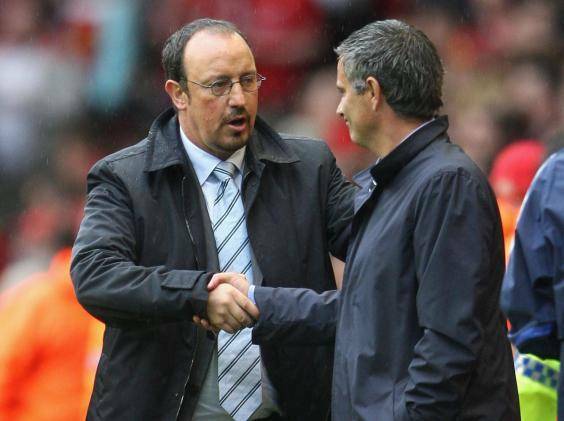 The rivalry between Jose Mourinho and Rafa Benitez has been a long running one, but the Newcastle United coach refused to discuss his relationship with the man he has followed in the dugout on three separate occasions. The Magpies travel to Old Trafford to face Manchester United on Saturday in the latest clash between the pair. The tension began after the Champions League semi-final between Chelsea and Liverpool in 2005, when Luis Garcia's 'ghost goal' put Benitez and his team through. Since then, both have managed Real Madrid, Chelsea and Inter while exchanging harsh words both in the press and in the dugout. "We will play against Manchester United. It's not the keyfactor, one manager or the two managers," Benitez said. "Mourinho has won a lot of trophies in different countries with a lot of teams, so he's a good manager, and that's it. "We will play against Manchester United and I am really concerned about [Romelu] Lukaku, [Juan] Mata, [Ander] Herrera, [Nemanja] Matic, [Marcus] Rashford, [Anthony] Martial -- that's my main concern." On his own side, Benitez remains optimistic about Newcastle's chances of survival with them currently in mid-table, five points off the drop zone and five points off the top four. "We are a newly promoted club that has to settle down in the Premier League," he admitted. "We have a young squad, so it's a learning process for everyone and losing some games is part of the process. "Hopefully we can stop that this weekend, but we know it has to be like this. We have to think that the target is to stay in the Premier League, then after try to go as high as we can in the table. "I have been asked about 40 points - we have already have 14 and if we come out of the first half of the season with 20, we can be optimistic."